“How can I download video through link? 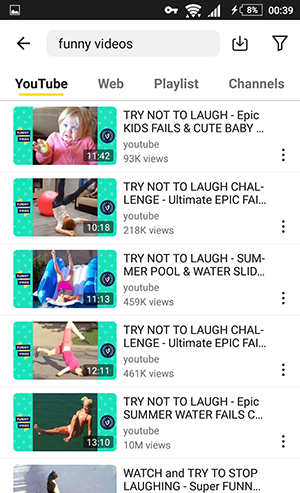 I wish to save a YouTube video on my phone, but can’t seem to find a feasible solution.” – If you are also a video enthusiast, then you must be having a similar query as well. Earlier, users need to go through a lot of hassle just to download a video from its link. Thankfully, there is an app for everything these days. Now, you can also download video from link by using a reliable app like Snaptube. In this post, we will make you familiar with a step by step procedure to do the same. Let’s get it started! One of the best ways to download video from URL link is by using a link video downloader like Snaptube. The free Android app has brought together all kinds of video sharing and streaming platforms in one place. Besides looking for any video on these platforms by entering relevant keywords, you can even provide its URL as well. Snaptube can be used to download videos from numerous sources. You can just provide the link of the video you wish to download and save it on your phone. If you want, you can even watch a video on your phone as well. Snaptube features a fast-loading player that would minimize the buffering speed. Users get an option to save a video in different resolutions and sizes. You can also discover the new and trending content related to your interest on the app as well. No need to root your device to download Snaptube. Snaptube has a sleek and friendly interface. Therefore, you won’t face the slightest of trouble while downloading videos from different sources. Ideally, you can do it in two ways. Visit the official website of Snaptube and install the app on your phone. Once the app is installed, go to its Settings (under App Permissions) on your Android device. From here, you need to provide Snaptube the permission for a floating window. Now, just launch any browser or a video app of your choice. 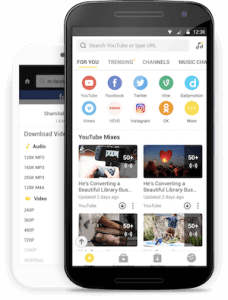 For instance, Snaptube can directly download videos from platforms like YouTube, Instagram, Dailymotion, Facebook, and more. Go to the link of the video that you wish to download. Adjacent to the video, you can view a floating download icon (provided by Snaptube). Simply tap on it. You will be provided with different resolution options for the video. Simply select the desired option and wait for a while for the video to be downloaded. 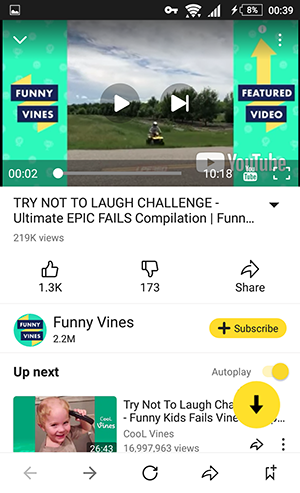 If you don’t want to make changes on your phone or don’t have the floating window setting, then you can simply use Snaptube’s app as well. In this way, you can use Snaptube as many times as you want to download video from link. Firstly, visit the website or the app from where you wish to download the video. For instance, if you wish to download a video from YouTube, then go to its app or its website. Visit the video that you wish to download and copy its URL. If you are using its app, then you can tap on the share icon and copy its link. Great! Once you have copied the link, launch the Snaptube app on your phone. Tap on the search bar and paste the video link. The app will look for the video and provide its thumbnail. To save it, you can tap on the download icon adjacent to the video thumbnail. To watch the video first, you can just tap on its thumbnail instead. This will open a dedicated video player. There is a download icon below the video player as well. Simply tap on it to save the video. As the app will provide different resolution (and size) options for the video, you can simply make the desired selection. Wait for a while for the video to be downloaded. Later, it will be available in the Videos app on your phone or under the “Downloads” section on Snaptube. 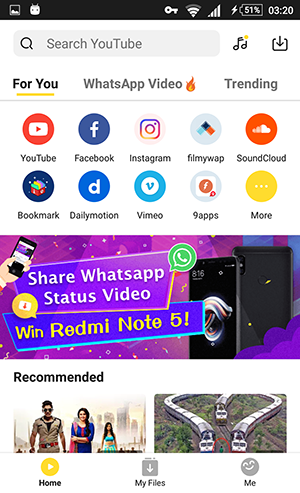 Note: In order to download Snaptube on your device, you need to first go to its Security Settings and enable the app download option from Unknown Sources. In this way, you would be able to download apps from sources other than Google Play Store. As you can see, Snaptube has made it quite easy for us to download video using link. You can go to its website or even download a video directly from a third-party platform. It is a remarkable app that will let you look for a video from all kinds of platforms in one place. Go try the app right away and download as many videos as you want for free.